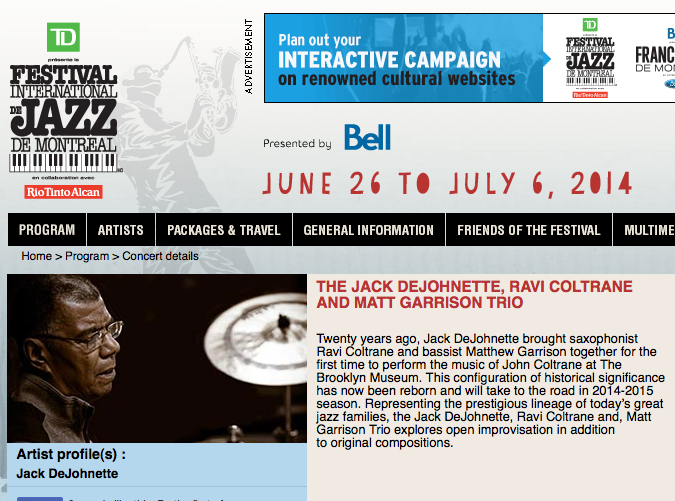 Jack DeJohnette Trio will be performing in Canada at the Festival International de Jazz de Montreal. Twenty years ago, Jack DeJohnette brought saxophonist Ravi Coltrane and bassist Matthew Garrison together for the first time to perform the music of John Coltrane at The Brooklyn Museum. This configuration of historical significance has now been reborn and will take to the road in 2014-2015 season. Representing the prestigious lineage of today's great jazz families, the Jack DeJohnette, Ravi Coltrane and, Matt Garrison Trio explores open improvisation and original compositions. Check full details here.